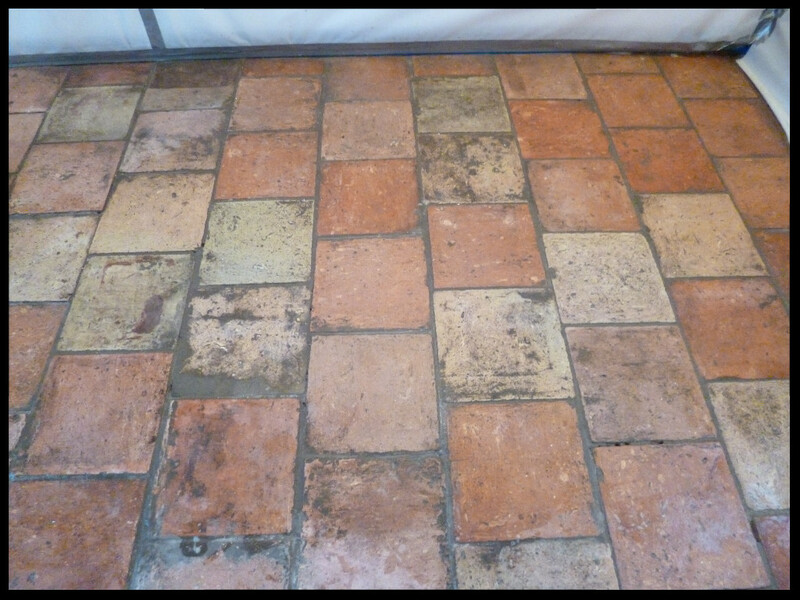 The client’s requirement for this particular job was to clean and restore a very old and porous Pamment tiled floor in the dining room of an old house in the Norfolk Market town of Wymondham. My client impressed upon me the need to restore the floor without removing any of its considerable character and to provide a high degree of fluid and stain resistance which I was confident would not be an issue having worked on similar floors before. The floor originally dated from the late 18th century and had clearly suffered many years of abuse and neglect; there was evidence that at one time, the entire area had been covered by linoleum which appeared to have been stuck down with a type of hide glue, leaving large patches of the adhesive firmly stuck to the surface of the tiles. 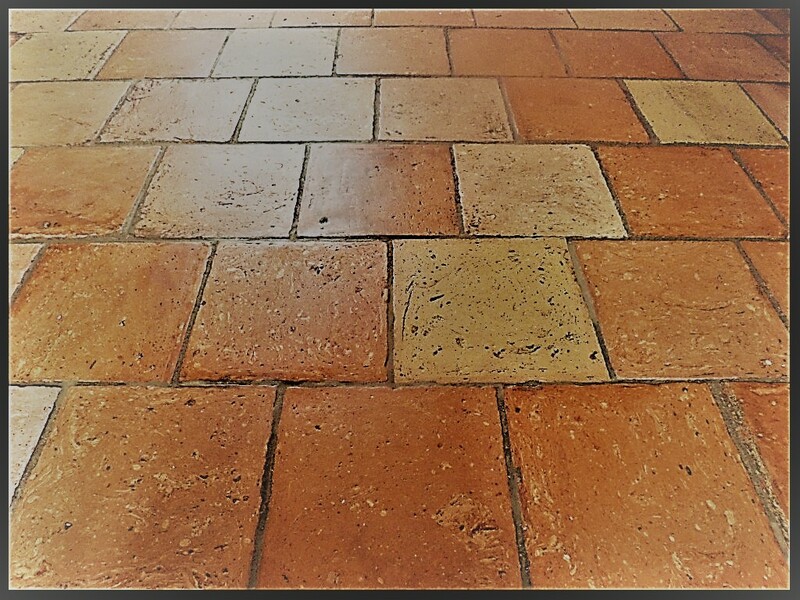 Pamment tiles are very popular in Suffolk and Norfolk homes and I often come across them; they are made from clay and, like Terracotta, are porous and therefore need to be sealed to prevent ingrained dirt. Pamments are quite versatile however and can be used for internal floors and external surfaces like patios. The first stage of the renovation was to apply a strong dilution (1:2) of Tile Doctor Pro-Clean to the whole area which was scrubbed in with a rotary machine fitted with a black scrubbing pad. The resulting slurry was power-rinsed and vacuumed away using our Ninja machine which makes light work of these tasks. Tile Doctor Remove & Go was then applied to the remaining patches of paint and glue and allowed to remain in contact for thirty minutes before being scrubbed again with the black pad and rinsed with clean water. A few particularly stubborn glue patches were finally dispatched by steaming after the application of Tile Doctor Nanotech HBU Remover. The cleaning being complete, the odd bits of missing pointing were replaced using a grey-coloured fast-cure compound and the whole area was left to dry thoroughly overnight with the assistance of our large capacity dehumidifier. Returning the following day, the floor was tested for moisture content using a damp meter to ensure that the chosen sealer’s performance wouldn’t be adversely affected by the presence of too much water in the substrate, particularly bearing in mind that there certainly wouldn’t be a damp proof membrane present in a floor of this age. The dehumidifier has done its job and I was able to start the sealing process with a single coat of Tile Doctor Colour Grow which is an impregnating sealer that works by occupying the pores in the tile so dirt cannot. Colour Grow is also a moisture-tolerant, breathable sealer that has the additional benefit of enhancing the colours within this kiln-fired tile without affecting the look and feel of the surface. Our clients had said that they would prefer a slight shine to the flooring if possible, so a further three coats of Tile Doctor Seal & Go were then applied to the whole area which provided maximum fluid resistance with a mid-sheen finish which would make daily cleaning much easier and more effective. The client was really pleased with the transformation and left the following comment.